- A speed stat. Its another stat and it affects how fast you move and if weaker people can see you. What i mean is, you know how ultimate shinobi and other people have those icons that move but in like black lines so you cant really tell where they go? well like that and if you had enough speed of your own you could see that person move (without the lines) so you can actually tell where they move. - Sword attacks. Could be random or have an option for horrizontal or vertical. Horrizontal does less damage but hits all three squares in front of you, vertical= more damage but only direcly in front of you. - Uchiha bloodline is kinda underpowered compared to rinnegan. I think that with the sharingan you should be able to see through clones at 2 tomeo and tell where people are after a kwaarami. At 3 tomoe you can read a persons handsigns and tell what jutsu they are going to do allowing you time to dodge. Also i think that we should have a way of copying some jutsu since thats the good thing about sharingan. If the speed thing was added they should also be able to read movements easier. Sharingan users shouldnt be affected by other sharingan users freezes and the amaterasu shouldnt be a ball of fire. 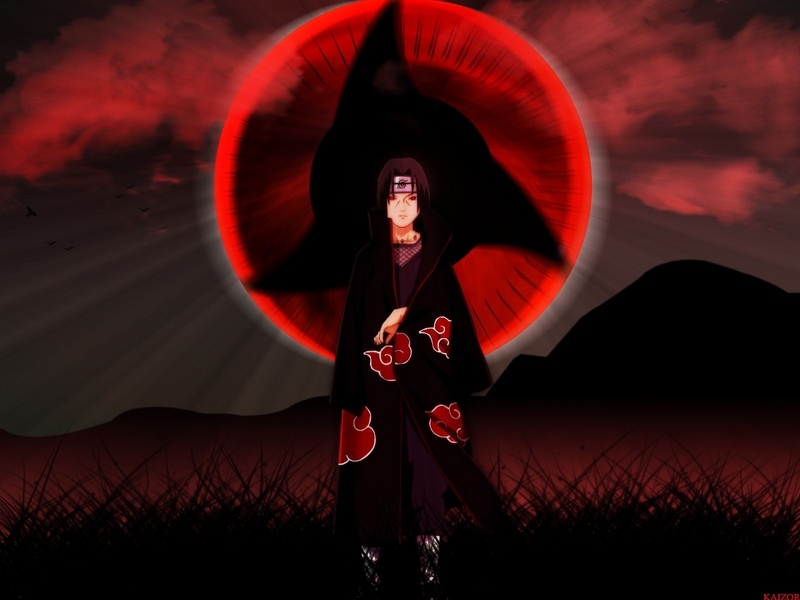 Im think something like shinra tensei because itatchi didnt really SHOOT the amaterasu it kinda just appears. I also think that tsukiyomi shouldnt just be like a freeze move. Maybe like you use it and take them to a maze. You're invincible and trying to kill them but i time runs out you will die of exhaustion. So you have to kill them before time runs out. - Cooler+more clashes and cancels. Chidori vs kaiten. If two homing jutsus hit eachother they should cancel out. OR say i use goukayuu no jutsu if i hit an oncoming jutsu it should cancel it. - Make chidori and rasengan easier to use. Instead of putting exact amounts i think there should be an option in commands to set the amount of chakra. You really cant use these unless your planning a clash. -Make ways to get OUT of capturing jutsus. For example, countering a freezing jutus with a capturing jutsu. wow you're all very creative and i love your ideas. this one was, though, a very good one that i think you should get matt's attention to. O_O GOT MINE, AND IT GOT MORE ATTENTION THEN WHEN YOU RAN AROUND NAKED! - Make the game more ninja-ish. We shouldnt always be running up to people and spamming attacks. Im thinking we should make the trees bigger so we can hide behind them and add a Hide verb and the ability to henge trees or other surrounding objects really confusing ppl. Homing attacks should only work if you know where the person is, meaning unless you have a dojutsu and can see them you shouldnt be able to just shoot a homing attack and hit them. - Kage Bunshin should have formations. Defensive where they bundle up around you, offensive where they follow and attack things and block off where the bunshins will surround a person. Switch places command which makes all the bunshins flash step and change around including you to confuse people. - Make chidori a dashing move where you go very fast but when u stop u keep going for 3 squares. -Make different arenas. A fire one, water, sand, maze one, etc. - Make certain jutsu work differently in different places. Ex. Sand coffin should normally Shoot a wall of sand at a person and if it hits you get them instead of the way it is now where you just press the button and catch them. Now in a sand arena, you should be able to use it the way you can now. - A Custom jutsu. Taking this from a DBZ game but i thought it was pretty cool. You make your own icon and make that jutsu. Choose the type, gokakyuu, projecticle, homing, AoE, and charge attack (chidori+ rasengan). Raise the strength with AP. - Make capture moves have a 40% chance to have a forewarning. With a dojutsu at full strength it will happen all the time. Ex: Sand Burial -> You see sand begin to form around your ankles. - Going demon should get rid of captures or there needs to be like a struggle button or something or break. Captures+ freezings = overpowered. - Tessenka no mai--- we just need attacking icons in general. Then from there just make it dodgeable. -I agree with tomiec about something for being a pure clan. Pure hyuugas should have a byakagun 3, uchihas - mangekyou. Rinnegan >_>? idk its overpowered in the manga .-. Dante - I like your ideas in your first message. A lot of things is underpowered, and other thing is overpowered. Abot the eyes for pure clan, i understand what you mean and i will give you the right. You are relly a creative person. Again, i like your ideas and i hope that will become something.